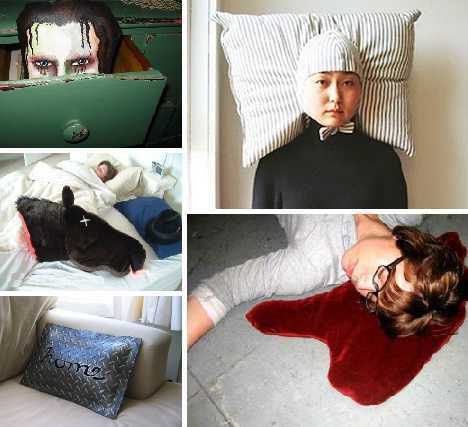 Sleeping beauties they’re not, and sweet dreams may be too much to expect from these 15 nightmarish pillow designs. 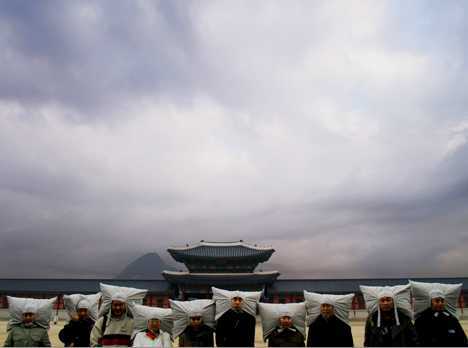 Whether you’re a certified head case or looking to become one, sooner or later everybody’s head hits the pillow case. When your time comes, they’ll be waiting. Well ain’t that a kick in the Cretaceous! 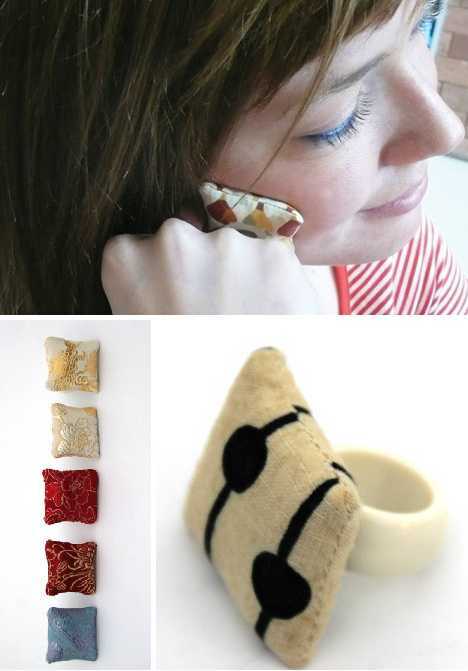 Japanese designer Sayaka Yamamoto has created “a collection of soft interior objects inspired by dinosaur bones”, though for what ultimate purpose? 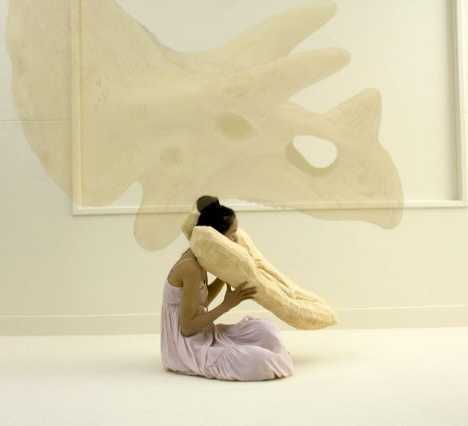 Inspired by bones they may be, but these ivory-hued pillows made from rubber-coated foam make osteoporosis sound good. 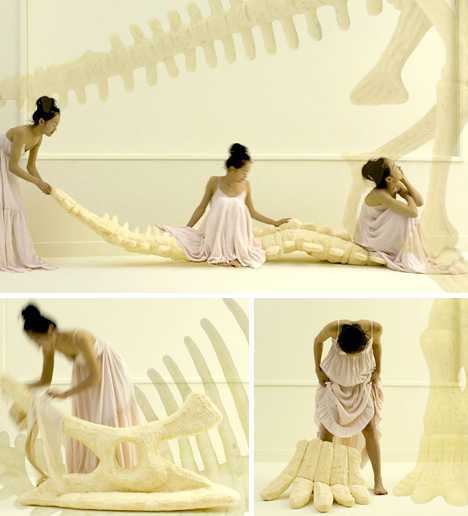 Make no bones about it, Yamamoto’s foamy fossils add a distinctive touch to one’s home decor scheme. They’re not recommended for dog-owners, though… you think Fido chews up the furniture now?? 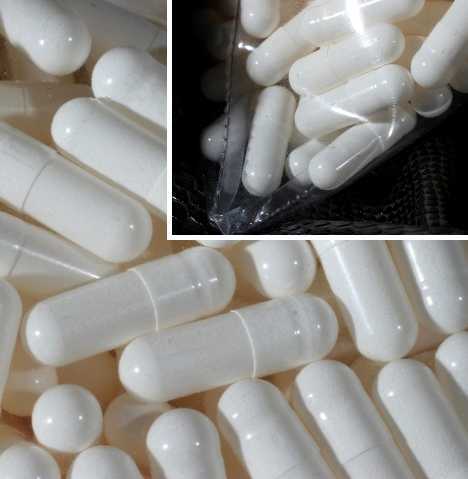 It’s no fun being a narcoleptic… until now! 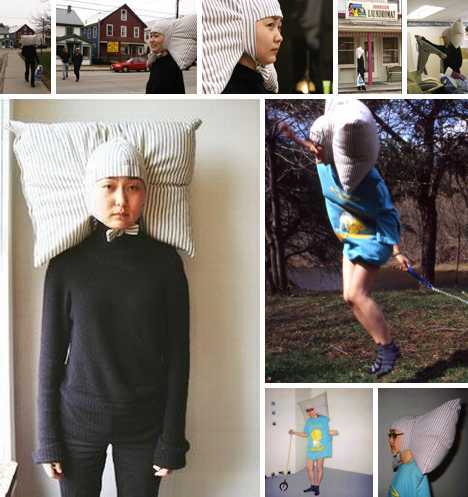 Korean artist and designer Joo Youn Paek created the wearable Pillowig to, as he puts it, “comfort tiredness of people in daily lives, enabling users to sleep comfortably whenever and whenever they’d like.” Paek may have something here: out of 50 Pillowigs produced, he sold 47. Kinda gives a whole new meaning to the term, “Sleepyhead”. It takes a special kind of person to wear a Pillowig in public, but thankfully these kinds of people tend to congregate with one another and leave us regular folks alone. 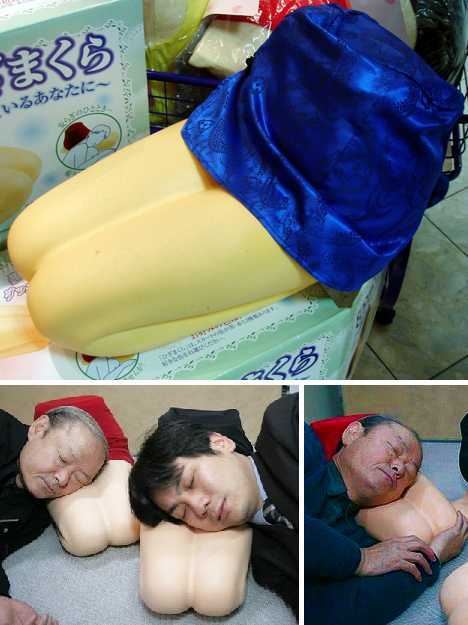 Available in red-skirt or black-skirt versions (plus red and blue “silk” for Chinese export), the Hizamakura knee lap pillow is the ideal comfort item for guys who are going through a particularly difficult break-up… and also for guys who’ve never had the chance to experience a break-up in the first place. Just in case potential buyers are confused by the exact purpose of an imitation woman’s torso, the Hizamakura knee lap pillow’s packaging includes a helpful illustration of the suggested usage. Now I feel so much better. What’s good for the gander is good for the goose, as the Boyfriend Arm Pillow so succinctly demonstrates. This item strips away all the extraneous attributes gals don’t need in a guy, especially if all they want is some sleep. 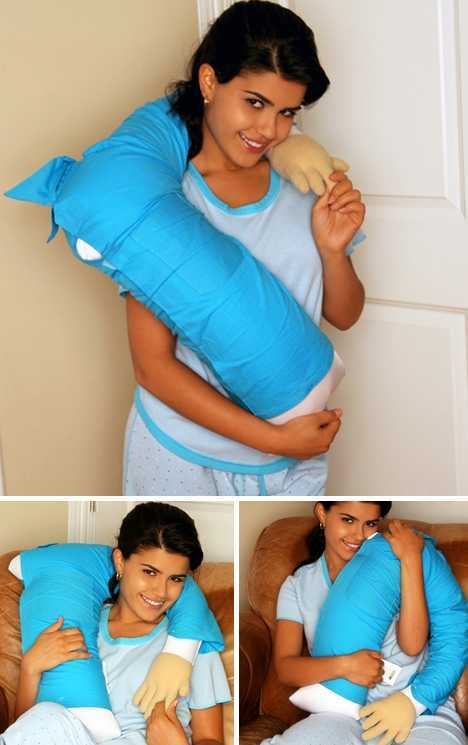 The Boyfriend Arm Pillow is being sold at ActiveForever.com, a site specializing in “Medical Supplies, Safety Equipment & Innovative Health Products.” Not like those pervy Lap Pillows at all, amiright? Looking like Two & a Half Men minus the two men, the Boyfriend Arm Pillow reeks of crass exploitation… or, it just needs a wash. 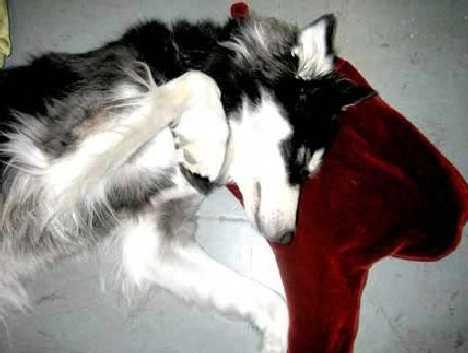 Sometimes you’re so dead tired you want to shout out, “Don’t let anyone wake me unless it’s the coroner!” Sleep on the Blood Puddle Pillow and your wish just might come true. Of course, choosing to have a massive brain hemorrhage while clowning around with the Blood Puddle Pillow just might be a self-fulfilling prophecy. This is a rare example of a product that can be used by both Man and Man’s Best Friend. 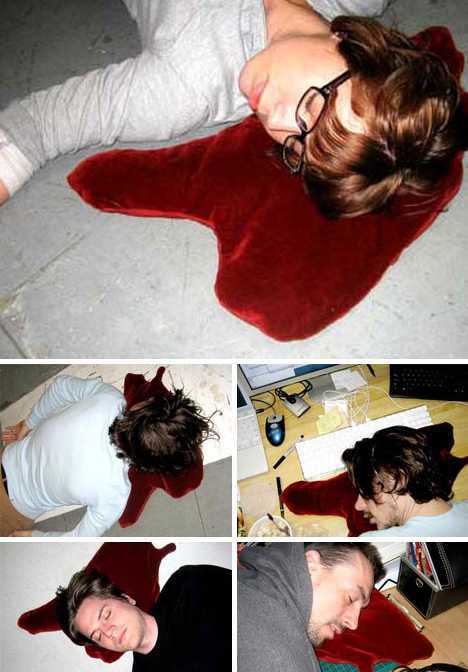 We were going to call it the “Blood Poodle Pillow” but reading that would probably make your head explode for real. So you think Japan is all Hello Kitty cuteness and giggly schoolgirls squealing “kawaii!” every 2 seconds? That pretty much covers it but admixed into the sea of smiley-faced sweetness is an undercurrent of unease. 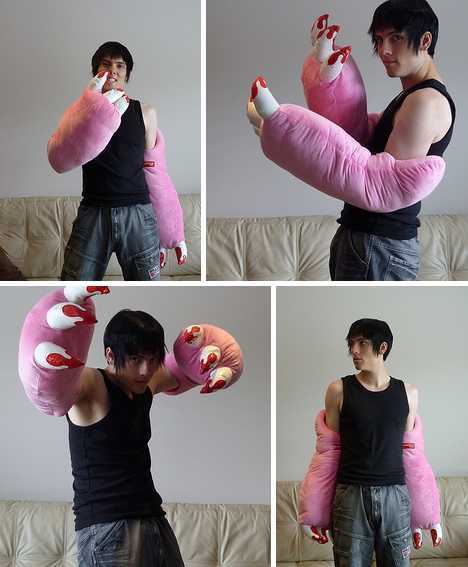 Take these Gloomy Bear Claw Pillows, for instance. The story of the surprisingly popular Gloomy Bear character goes something like this: Gloomy Bear was orphaned as a cub and rescued by a young boy. As Gloomy grew, his natural wild & savage instincts prompted him to attack his owner in increasingly violent ways – as the bloody red claws indicate. That’s OK, though… he’s pink! We’ve heard of slapping a chilly T-bone steak over a shiner but laying one’s head upon a fresh salmon? Y’know, it just might work… for WHAT, we don’t know. 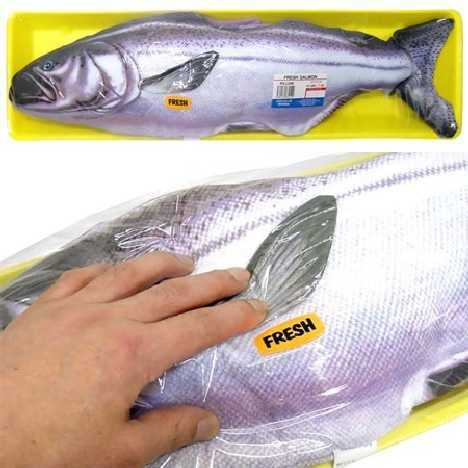 Suffice to say that the Fresh Salmon Pillow is 70cm (28″) long and according to the manufacturer, does not smell. So much for realism. You can wear your heart on your sleeve but can you wear your boredom on your finger? Yes, yes you can! 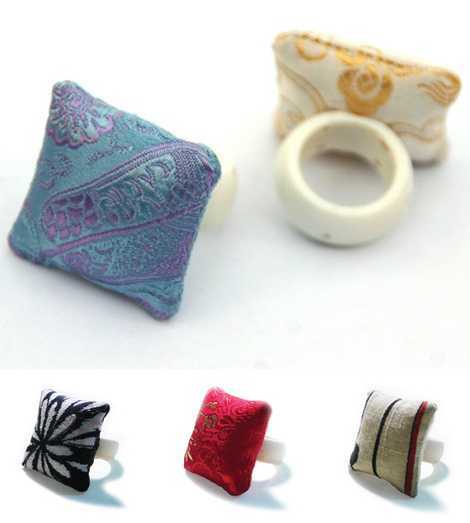 The “Pilo-Pilo” mini cushion ring from designers Lenny Ming Lo and Sae Shigeto of Downstairs Studio offers those bored at work, play or life in general an instant respite from tedium right at their fingertips (or thereabouts). Definition of “killing with kindness”? Bring a fistful of Pilo-Pilo rings to a brass knuckle fight. You probably won’t win but you’ll definitely crack a few smiles. So you’re Bond, James Bond, and Oddjob’s razor-sharp fedora just zipped by your nose. How to reply? 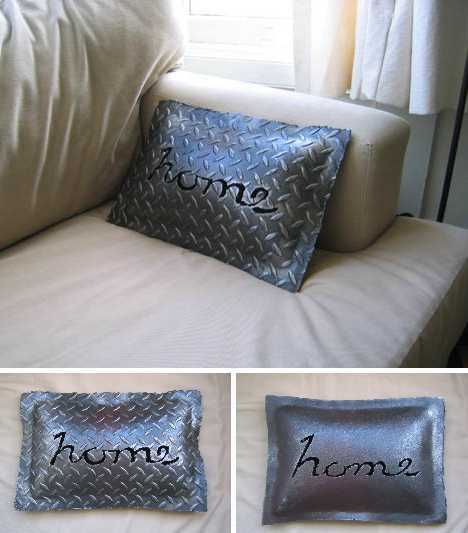 Make like Tom Brady and toss one of these steely pillows his way. They only LOOK like they’re encased in iron, however, so prepare to run like Ochocinco after an incriminating tweet once you’ve let the fluffy faux-ferrous missile fly. Jean-Philippe and Gaston Valeur of CarteBlanche are into “cocaine-chic couture” but their so-called “Pill-O” references equally abusable but outwardly respectable prescription drugs. The Pill-O is an interesting concept to be sure but we’re not convinced of its practicality in real life situations… say, going through the baggage check at the airport. 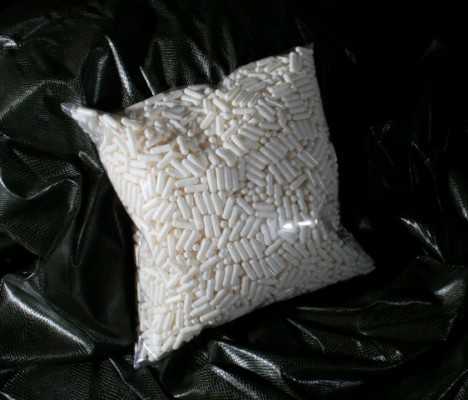 Just tell those burly TSA dudes it’s a pillow, they’ll understand. Now here’s an excellent example of thinking ahead. 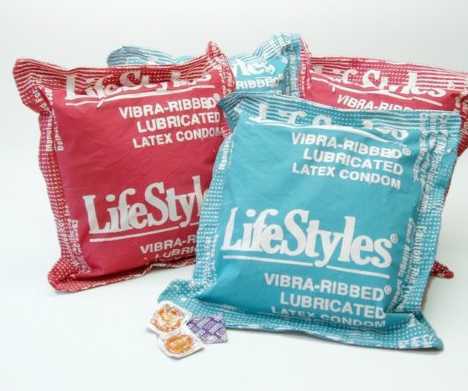 The Giant Condom Pillow not only serves as a friendly reminder to sleep (or whatever) safe, it features a handy-dandy pocket within which one may store miniature versions of the pillow conveniently within reach. The decorative lining adds to the professionally finished look & feel of the pillow. So how is this frightening, you may ask… just put yourself in the place of some innocent yet nubile young ting returning to her first date’s pad for, ahem, coffee. He gives her the grand tour and what do her wondering eyes see but his intentions, laid out plainly along with his PJs. Now THAT’s scary! 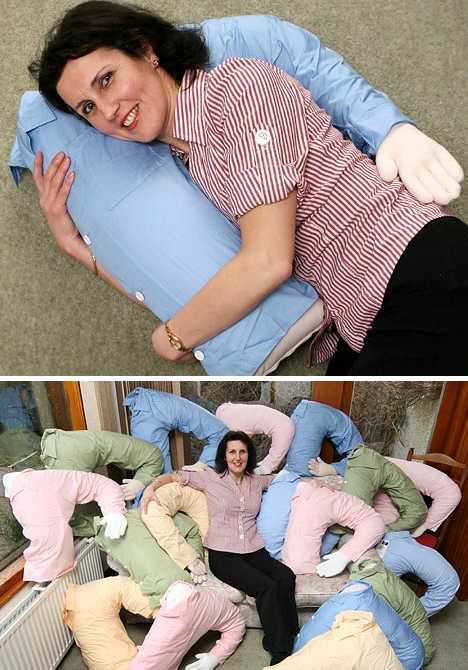 To be honest, we wouldn’t want to lay on this pillow with somebody else’s head. How to describe this dark work of occult folk art? It looks a little like Chuckie, the malevolent & murderous doll from the Child’s Play horror flick franchise crossed with the Hypnotoad. 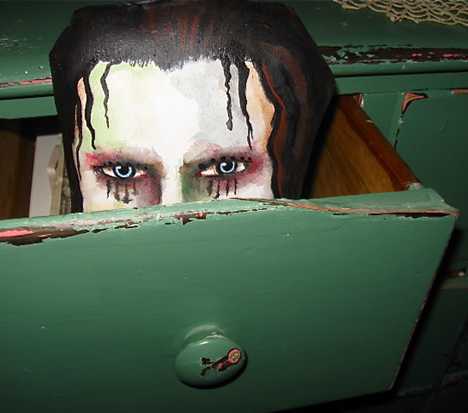 It’s a good thing Charles Lee Ray didn’t transfer his evil soul into this pillow… let’s just hope and keep on hoping! Now was this really necessary? 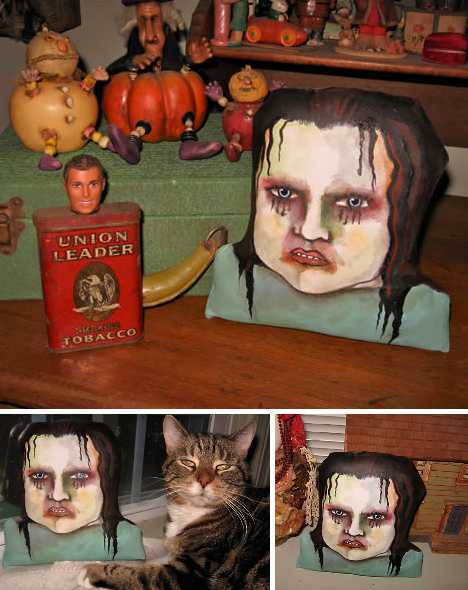 Wasn’t “The Creepiest Pillow Ever” more than creepy enough without posing it inside a box with only its soulless eyes showing? Brazilian artist Ernesto Neto gets his inspiration from neo-concretism, an artistic movement of the late 1950s and early 1960s in which art is equated with living organisms to form a sort of “organic architecture”. We’re not sure what Neto’s gigantic pillow/bed is meant to represent but if used in a pillow-fight, it could be considered a WMD. 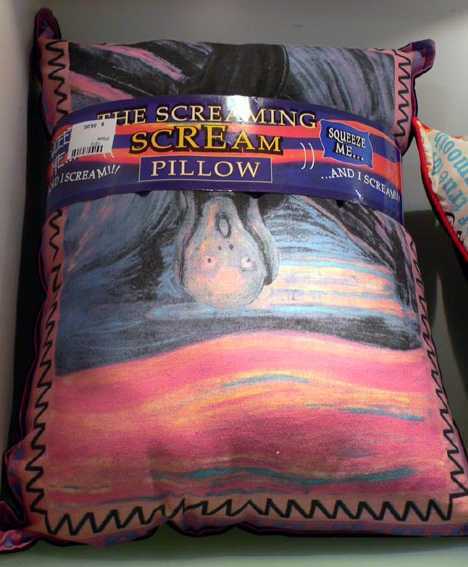 It had to have taken a deranged mind to come up with The Scream Pillow but to add a mechanism that invites one to “squeeze me and I scream”? That’s pure genius right there. Of course, once you unpack your pillow and lay it out on the bed, your better half won’t know his or her pillow actually screams until their sleepy, unassuming head hits it… YouTube, here you come! 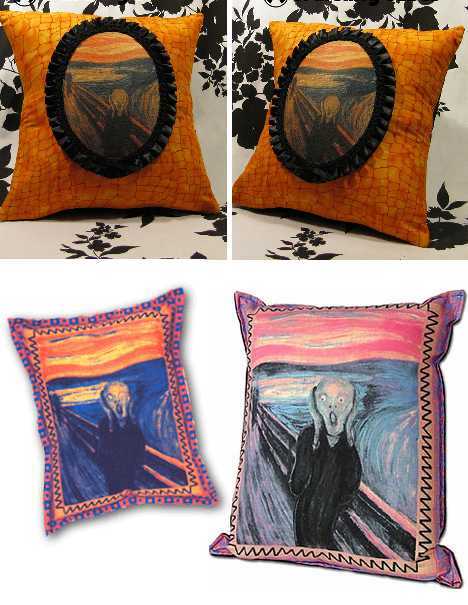 The Screaming Scream Pillow is an astonishing example of what happens when high art meets low novelty. Really, what’s next? A Mona Lisa whoopee cushion? That could work, actually… now we’ll finally know what that enigmatic smile’s all about. 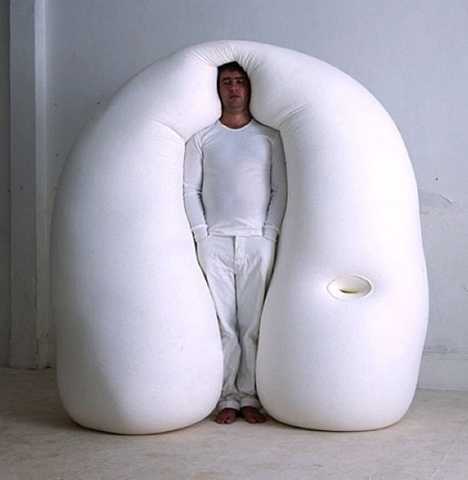 Induce the mother of all coronary infarctions with the godfather of all pillows! This plush, life-sized and anatomically correct (for the most part) horse’s head was inspired by the iconic scene in the film The Godfather when Mr Bigtime Hollywood Producer learns what happens when Don Corleone receives bad news. Whether on-screen or in real life, with this replica or an actual equine noggin, the end result will undoubtedly be the same. Now you can re-enact that classic bit of gory film lore in your very own home, starring your very own wife… pending her waking up half the neighborhood and filing for divorce. 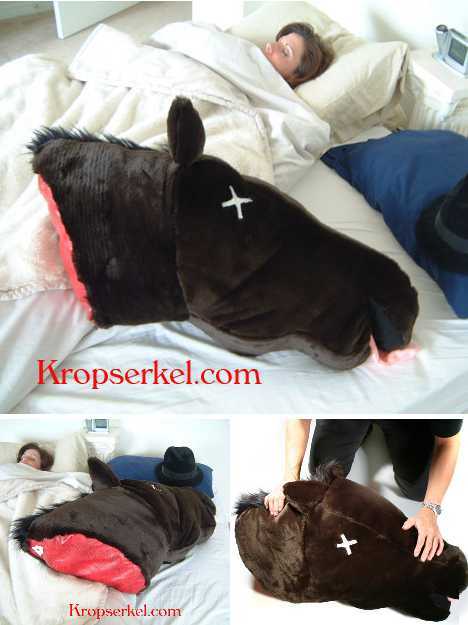 The Horse Head Pillow is available stuffed or unstuffed, the latter option intended to reduce shipping charges. Yep, you’ll need every cent you’ve got once she (or he – it’s a unisex shocker) sics a “mob” of lawyers on you for being a real horse’s rear.